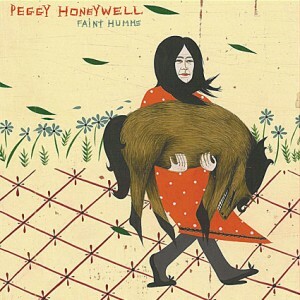 On Peggy Honeywell’s new album Faint Humms, her bluegrassy/country songs are filled with “her marvelous ability to capture—sincerely and passionately—the stuff childhood daydreams are made of: planets, birds, cats and sunsets.” The album was recorded in between the time she spends painting (she paints using her real name Clare E. Rojas and is currently showing work in the museum art show/book Beautiful Losers, which will be traveling the world over the next few years). This album is a follow up to her well received Honey For Dinner. Peggy sang and played everything (guitar, banjo, tambourine) and did all the cover artwork. The album was recorded in Chicago and San Francisco (where she currently lives). San Francisco recordings were done by Monte Vallier (Jet Black Crayon, ex-Swell).